Many of today’s homes feature soaring high ceilings and large, open living spaces. A wall unit that directs the purpose and positioning of your living space is often a beautiful accompaniment for these spaces and can provide both storage for entertainment components as well as display surfaces for treasured photos and mementos. 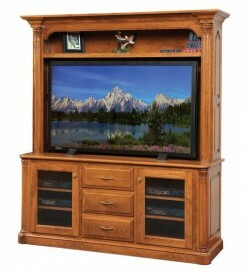 All of the wall storage units at Amish Originals can be customized to fit the décor and the dimensions for your home and your entertainment needs. 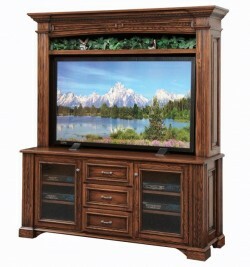 Every wall unit is made-to-order, so customers select stain color, hardware, open and closed door storage and wood species—making their wall unit a truly custom piece of furniture. All of our wall units also include the option to add matching storage bookcases that allow for a larger, more cohesive look in your home. 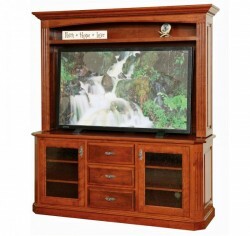 Our wall units are built by the fine Amish craftsmen of northeast Ohio; built with only 100% solid American hardwood, our furniture is constructed using time-tested techniques and with attention to detail not found in other home furnishings. 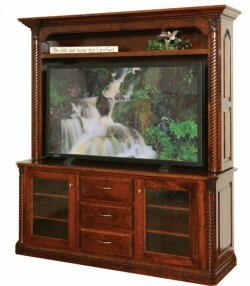 Our products come fully assembled and professional delivery is available. 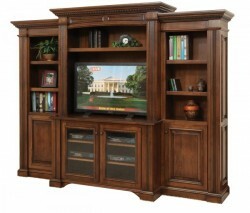 Come see the quality and learn more about our furniture by calling or visiting our showroom in Uptown Westerville. Shown in Brown Maple .